I Love You More Than Carrots: Growing Up On Cherry ChapStick. I received product from Pfizer Consumer Healthcare for free in exchange for my honest thoughts on ChapStick brand. 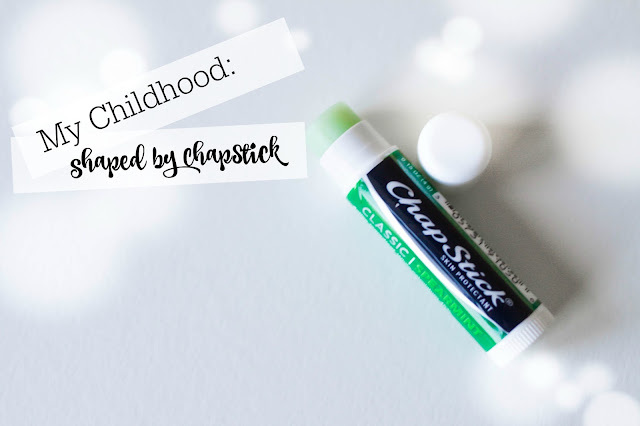 For as long as I can remember, ChapStick® was an integral part of my childhood. In fact, just the smell of the Original Cherry ChapStick® brings me right back to Sundays riding in the backseat of my dad's Mercedes, the smell of the pristine gray leather making me nauseous (because dad's car always smelled new), my little pink purse in my lap, on our way to church. I must've been 4 or 5 at the time and I distinctly recall unsnapping the shiny flap of that patent leather purses and pulling out my cherry-flavored ChapStick®, unscrewing the cap and sniffing it all the way to church. The ChapStick® was my "big girl" lipstick. It's what I would apply generously while watching my mom apply her makeup every morning. 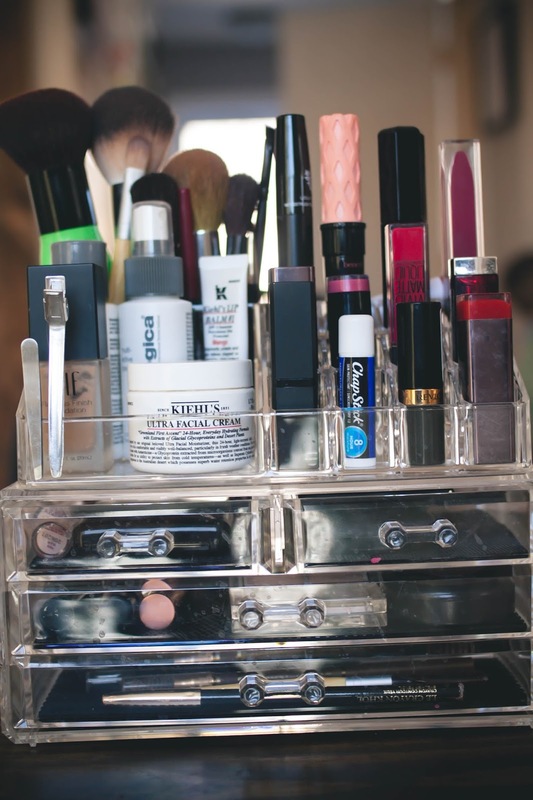 I would sit on the floor next to her vanity chair and while she would brush and swipe and dab, I would be swiping, smacking and smoothing, admiring my "makeup" smile. 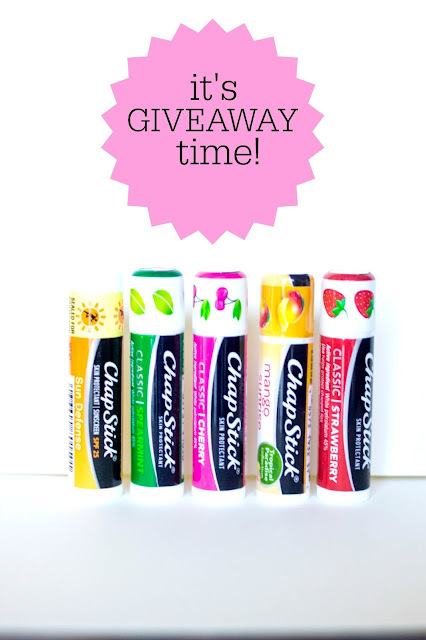 My love for ChapStick® only grew over the years and in middle school when I was only allowed to wear clear mascara and non-tinted lip-glosses, ChapStick® was there for me. I remember once in 6th grade bending the rules a bit and taking crushed up powder blush and mixing it with my ChapStick® to give me just a hint of color to impress Chris D., the 7th grade boy I was madly in love with. In high school, I kept a tube of ChapStick® in the rolled waistband of my plaid uniform skirt, the roll made it flattering, the hidden tube of ChapStick® made it functional. Although I left my love of Cherry ChapStick® behind in my youth, my love for the brand never waned as I was rarely ever without a tube of the Original flavor. When I turned 17 and bought my first car, I drove right to the drugstore where I picked up a two-pack of Original ChapStick® to keep in my glove box. I believe I was also playing Nelly on the radio. You win some, you lose some. Today, at 32, ChapStick® is still very much a part of my every day life. Although my beauty routine and love of various beauty products has vastly changed over the last thirty-something years and especially so after the births of my three boys, one thing has always remained and that's ChapStick®. Perhaps my favorite part of my morning beauty routine is, after using a lip exfoliator, applying a layer of ChapStick® to seal in moisture and keep my lips soft and supple beneath my lipstick of choice. My husband laughs at me because I keep tubes of ChapStick® all over the place. There's a tube in my car, a tube in my makeup organizer in the bathroom, a tube in the pocket of my favorite winter coat, a tube in the junk drawer in the kitchen, two tubes in my handbag, one in my son's lunchbox, one in his backpack and one in my middle son's underwear drawer for the ever-important Before Bed Application. 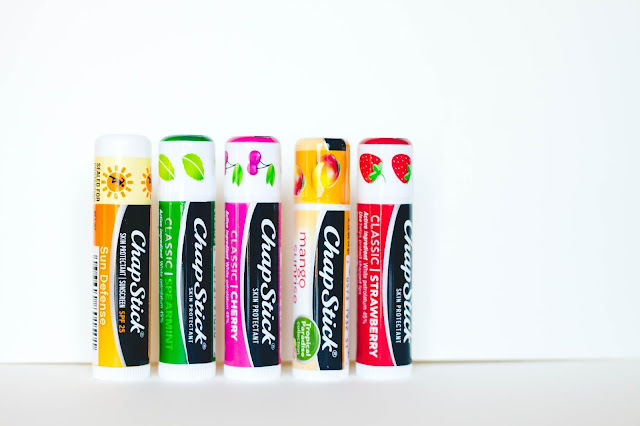 Not to mention the tubes in our laundry room that have been rescued from pants pockets before they hit the wash.
With a specialized formula for every lip need, ChapStick® is without a doubt an everyday essential that goes with me wherever I go. Whether it's ChapStick® Classic Range for everyday wear, ChapStick® Moisturizer for a softer, more supple pout or ChapStick® Sun Defense which delivers SPF protection along with moisturizing ingredients, I know there's a formula I can count on. My oldest son loves the brand new Chapstick® Tropical Paradise Collection which delivers not only the traditional softness and hydration associated with the brand but also a refreshing tropical tasting flavor! 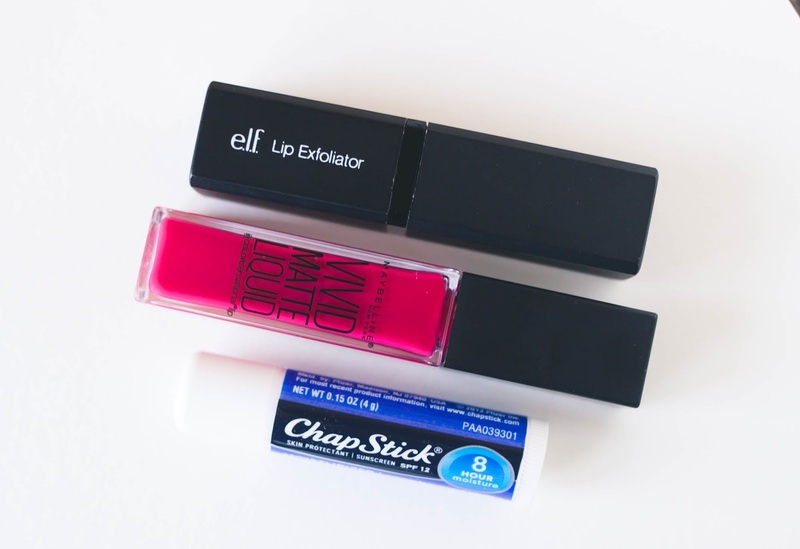 Did you know there are plenty of non-lip uses for ChapStick® as well? Try using it as a quick fix for those unruly eyebrows, or rub a little bit on the backs of chapped hands in the winter. You could even use it to remove rings that get stuck on your fingers or blend it with a bit of powder blush to create cream blush or even a new eye shadow pigment. If you're really in a bind, ChapStick can also help loosen stuck zippers and stop the bleeding of minor cuts (think: shaving). In 1987, from the backseat of my Dad's car on the way to church to my very first kiss in the basement of my friend Joey's house at age 14, to the operating room and successive births of all three of my boys, ChapStick® has always been there for me and just as my mom shared the ChapStick® brand with me thirty-something years ago, I love that I'm able to do the same with my kids. What One Smell Brings You Right Back To Your Childhood? Winner will be announced 2/23/16. Open to US residents only. Must have valid email address for entry. Good luck to all those who enter! Cherry...of course. The one and only. I think it is due to the fact that I love summer time and eating cherries, so I always associate good memories with that. Love ChapStick, and it's all through my house! The smell that takes me back is Playdoh...or maybe that white paste that they no longer make because all the kids ate it! So I was kind of obsessed with the Strawberry kind and it used to be really hard to find! The original black Chapstick is the one I remember from childhood. 😊. The cherry would be second. I remember classic original, and how we got those one time from my elementary school teachers. And we traded our chapsticks wad my favorite part. I think of strawberry chapstick. The one smell that brings me back to my childhood is the smell of coffee! I am not a coffee drinker, but my parents and grandparents where. I always remember waking up to the smell of coffee brewing!!! As for the chapstick...I always love the Classic Cherry! I didnt know they had so many great scents! I have to try some of the others! Cherry for sure!! Now it's original, or when I can find it candy cane. I love Chapstick and I also have it all over the house! I hoarded the cake batter flavor as soon as it came out. The smell of cucumber melon lotion always takes me right back to middle school! Sounds weird, but the smell of pasta sauce brings me right back to childhood. In my very Italian household, every Sunday was the day my mom made a pot of "gravy." Mmmmm. And as for Chapstick, I've always gone out of my way to find the minty flavor. Homemade bread! My mom made it on a regular basis for awhile and it was always so good! The smell of original Chapstick with the black label. My dad always has one in his pocket. The smell of a wood burning fire place takes me back to my child hood. Once I got older I hated that my clothes always smelled like smoke but now I miss sitting on the couch watching the fire flicker. I absolutely love original cherry - or peppermint at Christmas! The smell of the perfume my mom used to wear takes me back to childhood. I remember hugging her and always telling her she smelled so good!